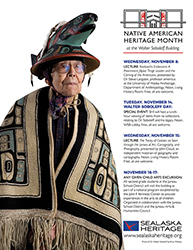 Lecture: Kaalaxch’s Endeavors: A Preeminent Jilkáat Tlingit Leader and the Coming of the Americans, presented by Dr. Steve Langdon, professor emeritus at the University of Alaska Anchorage, Department of Anthropology. Noon, Living History Room. Free, all are welcome. Special Event: SHI will host a lunch-hour viewing of items from its collections relating to Dr. Soboleff and his legacy. Noon, Walter Soboleff Building Lobby. Free, all are welcome. Lecture: The Treaty of Cession, as Seen through the Lenses of Art, Cartography, and Photography, presented by John Cloud, an independent historian of geography and cartography. Noon, Living History Room. Free, all are welcome. Any Given Child Arts Excursion: All second-grade students in the Juneau School District will visit the building as part of a national program established by the John F. Kennedy Center to provide experiences in the arts to all children. Organized in collaboration with the Juneau School District and the Juneau Arts & Humanities Council.